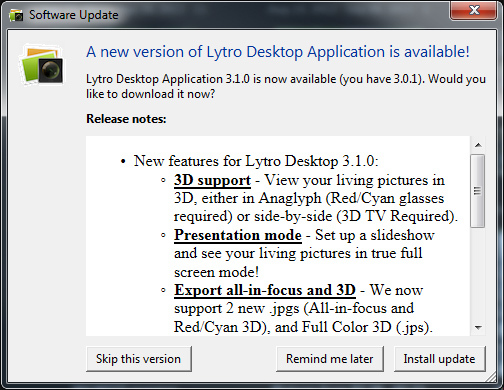 The following press release was published by Lytro on 19 October 2011. Mountain View, CA — October 19, 2011 — Today, Lytro, Inc. (www.lytro.com) unveiled the first Lytroconsumer light field camera, introducing a new way to take and experience pictures. Unlike conventional cameras, the Lytro light field camera captures all the rays of light in a scene, providing new capabilitiesnever before possible, such as the ability to focus a picture after it’s taken. The pocket-sized camera, which offers a powerful 8x optical zoom and f/2 lens in an iconic design, creates interactive “living pictures” that can be endlessly refocused. The camera is available in two models and three colors, starting at $399. The Lytro is the only consumer camera that lets people instantly capture a scene just as they see it by recording a fundamentally richer set of data than ever before. Lytro cameras feature a light field sensor that collects the color, intensity, and the direction of every light ray flowing into the camera, capturing a scene in four dimensions. To process this additional information, Lytro cameras contain a light field engine that allows camera owners to refocus pictures directly on the camera. When the Lytro’s living pictures are shared online, the light field engine travels with each picture so anyone can interact with them on nearly any device, including web browsers, mobile phones, and tablets—without having to download special software. 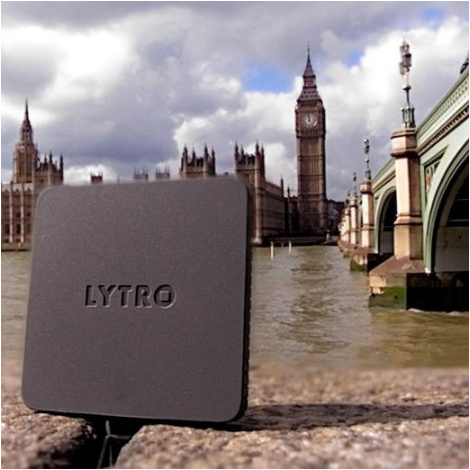 The Lytro’s sleek design was created with simplicity in mind. With no unnecessary modes or dials, the camera features just two buttons—power and shutter—and has an intuitive glass touchscreen that lets pictures be viewed and refocused directly on the camera. While the Lytro camera houses complex technology, it is fundamentally easy to use, opening new creative opportunities for anyone interested in sharing their favorite memories with friends and family. Low-light sensitivity: By using all of the available light in a scene, the Lytro performs well in lowlight environment without the use of a flash. Seeing in 3D: Coming soon! Captured as a full light field, all pictures taken with the Lytro areinherently 3D. Special light field algorithms, available in 2012, will be applied to the light field pictures to enable viewing on any 3D display and to enable viewers to shift the perspective of the scene. The Lytro light field camera is accompanied by Lytro’s desktop application, a free software download that easily imports pictures from camera to computer. Currently available for Mac OS X, the desktop application lets people view, interact with, organize and share their light field pictures. Lytro pictures can then be uploaded to Lytro.com to be shared via Facebook, Twitter, blogs, or as links in email messages.Once shared, Lytro’s living pictures allow viewers to live the moment with the photographer and explore ascene like never before. Viewers can continually interact with Lytro pictures — focusing them over and over — expanding the creative possibilities of each and every shot. Concepts related to the light field and computational photography have been researched in academic circles for more than a century. Light field science was the subject of Lytro CEO and Founder Dr. Ren Ng’s Ph.D. dissertation in computer science at Stanford, which was awarded the internationallyrecognized ACM Dissertation Award in 2007 as well as Stanford University’s Arthur Samuel Award for Best Ph.D. Dissertation. Dr. Ng’s research focused on miniaturizing light field technology into the body of a single camera to make it practical for everyday use. The digital still camera market is large and growing with $38.3 billion in worldwide revenue in 2010 and expectations to increase to $43.5 billion worldwide by 2015. * Visual storytelling is universal, with 60 billion photos shared on Facebook in 2010, projected to reach 100 billion photos by this summer. The Lytro camera is available in two models: 8GB ($399, 350 pictures, in Electric Blue or Graphite) and 16GB ($499, 750 pictures, in Red Hot). It is now available to order at Lytro.com and will ship in early 2012. The Lytro desktop application will be available initially for the Mac operating system; a Windows version will be available in 2012. For more information on the Lytro camera, please visit www.lytro.com/camera. For b-roll and product images, visit www.lytro.com/press. For a demonstration of living pictures, visit the Lytro Picture Gallery. Lytro is transforming the camera into a powerful computational photography platform, forever changing the way everyone takes and experiences pictures. The first Lytro light field camera offers photographic capabilities never before possible, such as focusing a picture after it’s taken, and creates interactive living pictures that can be endlessly refocused and enjoyed by friends and family online. CEO Ren Ng, whose Ph.D. research on light field photography won Stanford University’s prize for best thesis in computer science in 2006 as well as the internationally recognized ACM Dissertation award, founded the company in 2006. For additional information, visit Lytro.com. Next story How big is a Lytro picture?